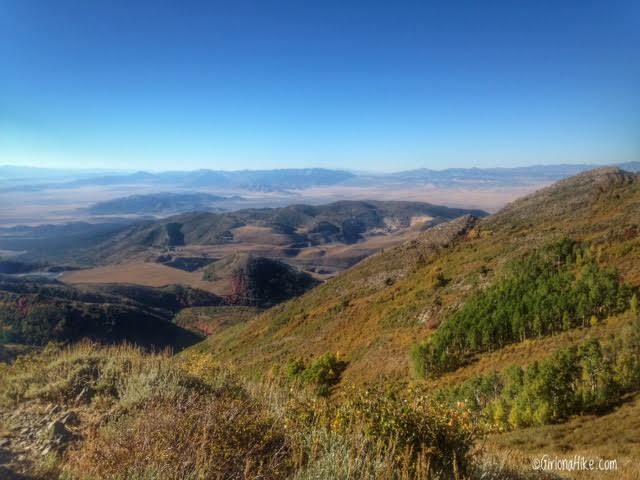 The hardest part about hiking to Flat Top Mountain and it's neighbor, Lewiston Peak (10,411 ft), is the drive. 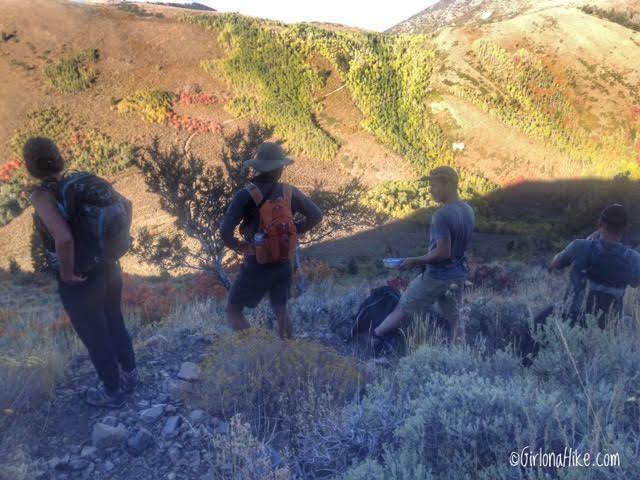 The most common approach is through the small, old mining town called Ophir (pronounced like "oafer") via Ophir Canyon. The dirt road past Ophir, UT will require a high clearance car, such as a jeep or truck with 4-wheel drive. Although the dirt road is only 3 miles, it feels longer. 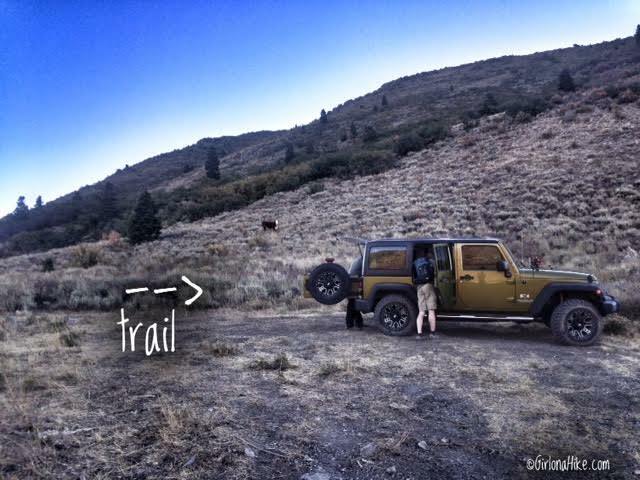 We took a Jeep Wrangler up the road, and deflated the tires to make the drive easier. What makes Flat Top Mountain so awesome are the surrounding views of Utah Lake, Mt. 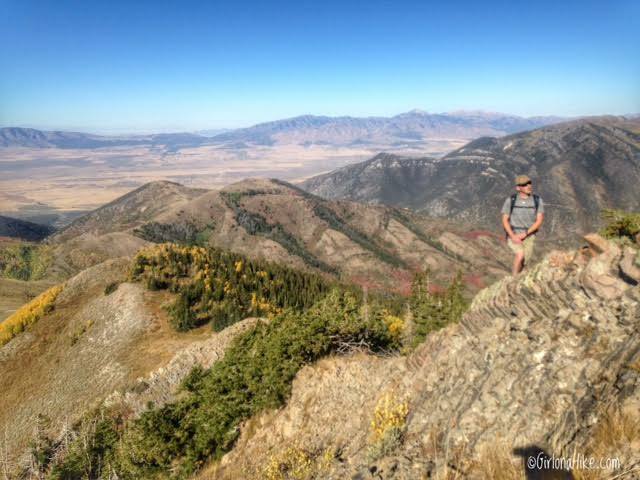 Timpanogos and other peaks to the East, Salt Lake Valley, & the Mercur Mine. You'll also find solitude - we didn't see another person the entire day. Wildlife can be present, especially elk and moose. 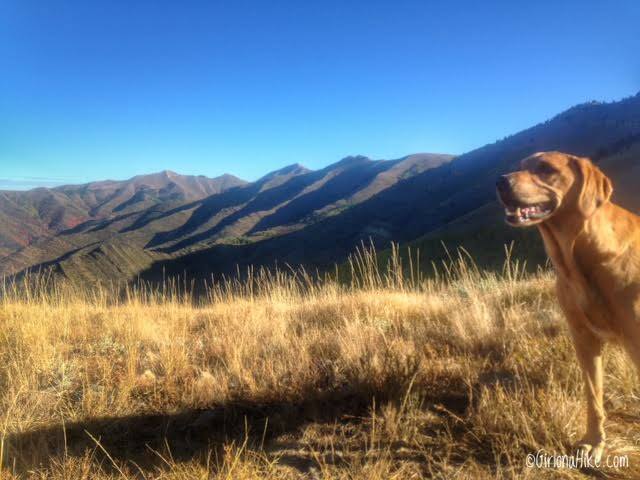 There are also no leash nor watershed laws, so dogs can hike here, and take in the enjoyment of being outside. 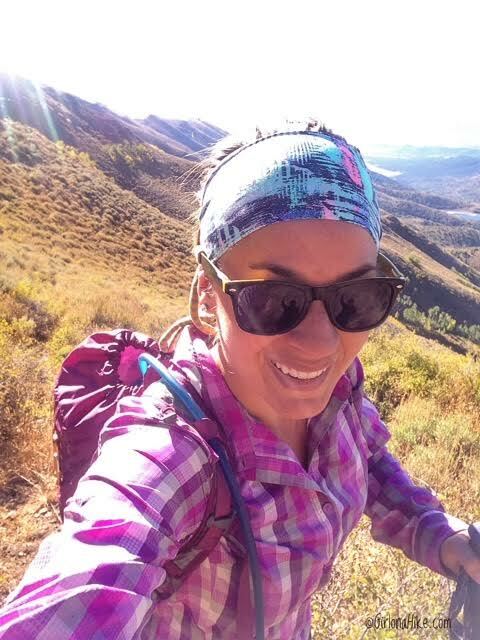 Be advised that there is no water source and very little shade on this trail, so be prepared with plenty of water, food, sunblock, and a hat. 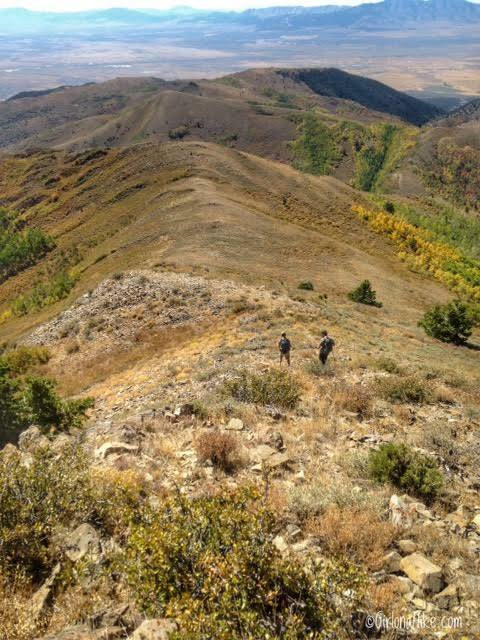 The best time to hike here is in Summer and Fall. Spring would not be wise, since the dirt road may be washed out from Spring melt off. From SLC head south on I-15 and take exit 282 heading West. Turn left when you reach HWY 68, then right onto HWY 73. Follow this highway for about 45 minutes, wrapping around the southern end of the Oquirrhs. 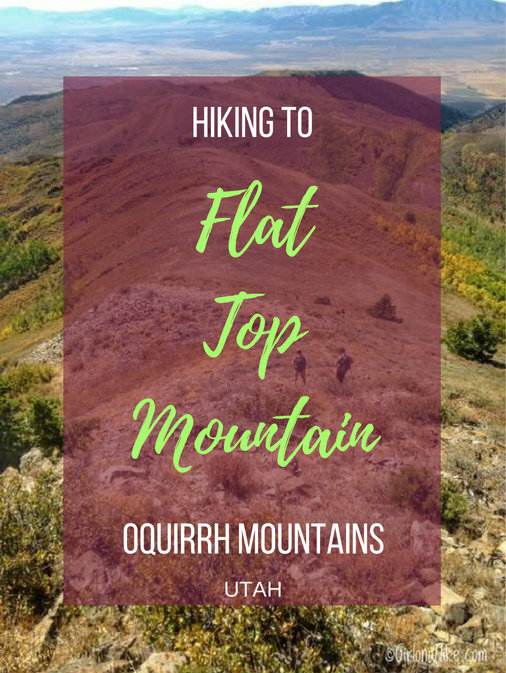 Once on the backside (West side) of the Oquirrhs, look for the small sign pointing right for Ophir, UT, which is between mile post 4 and 5. Drive the paved road through Ophir, UT for 5 miles, and just after the town, the paved road turns to dirt. 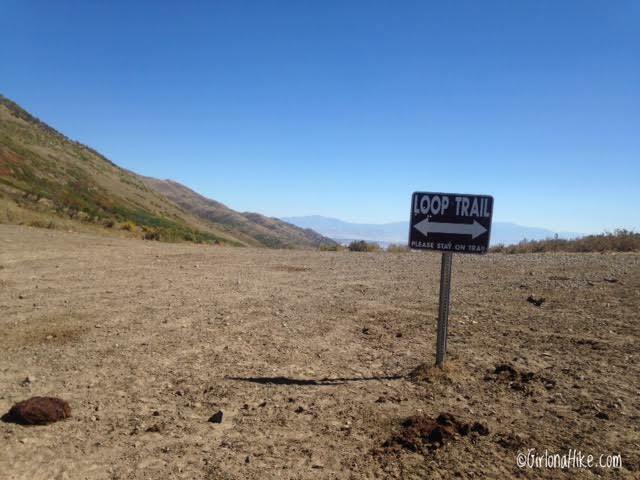 You'll see a trailhead parking area also on your right for Lions Loop, but drive past that. Look for the sign for South Fork, and turn right into the canyon. You'll pass another TH parking area on your right, keep driving past that. Drive up this rough road for 3 miles until you reach the 4-way intersection. The trail starts up the hill on your left. Here's a driving map. Total drive time from SLC is roughly 1 hour 15-1 hour 30 min. 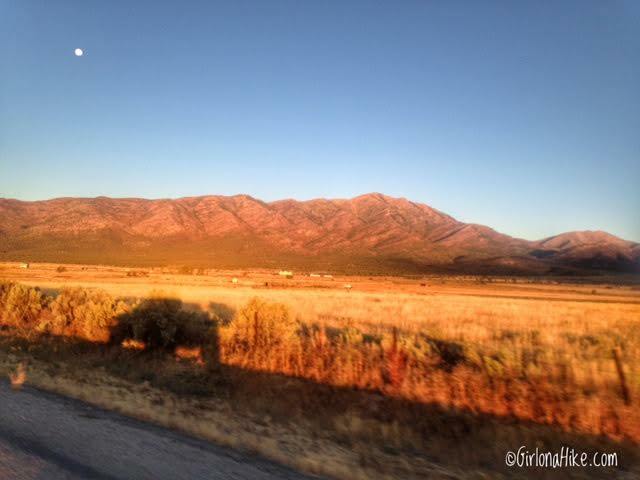 Driving out early in the morning, with a nice view of Flat Top Mountain during sunrise. This is the 4-way intersection, after you've driven up the 3 miles of rough road. The trail starts up the hill to the left. Our jeep was able to make it up about another 100 yards from the 4-way. The trail starts in the NW corner of the turnaround. 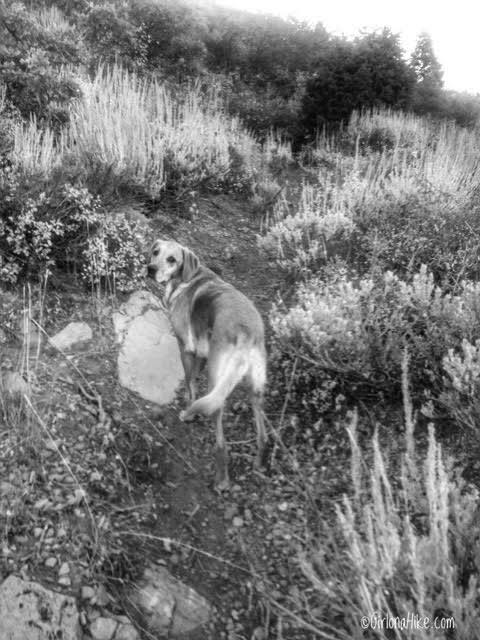 Charlie leads the way up the many switchbacks. Stopping to take off a layer. 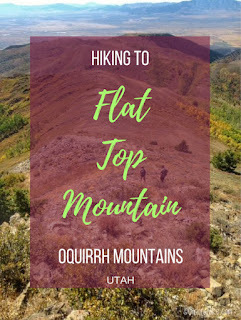 You'll want to wear pants on this hike - there are lots of low shrub, burrs, and also something that made my friends legs turn into a rash (he wore shorts). 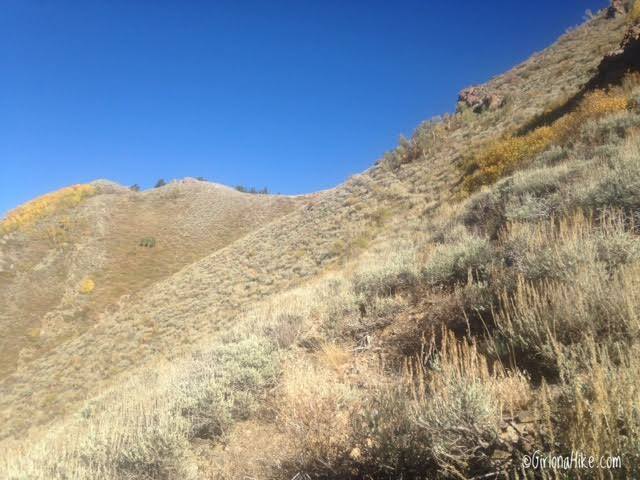 At 0.7 miles the view opens up to the rest of Ophir Canyon to the NW. The trail then levels out for the next 10-15 mintues as you wrap around the SE side of the hill. Looking over to the Mercur Mine, which became the site of the first successful use of the cyanide process of gold extraction in the US, the dominant metallurgy today. The town of Mercur, UT is now considered a Ghost Town. The trail eventually makes a sharp left turn, headed up to that small saddle. Once at the saddle our group decided to leave the trail, and aim directly up this ridge so that we could first summit Lewiston Peak. As long as you stay on the rocky (but stable) ridge, you'll reach the peak in no time. Working up the ridge looking West. You can see Deseret Peak! Whew! Finally on Lewiston Peak. It was pretty steep to this point, but well worth our effort. 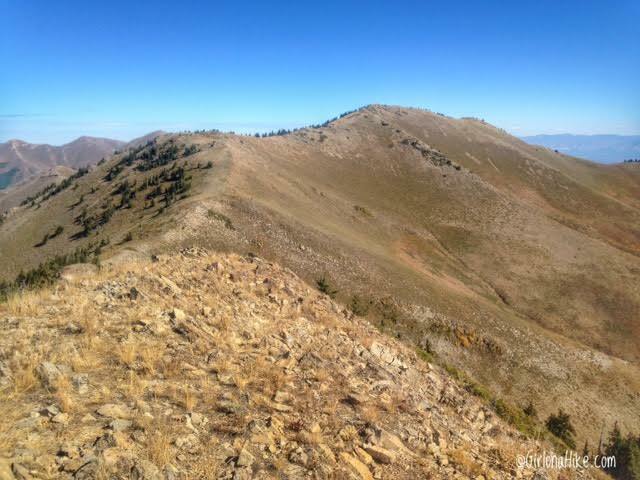 From Lewiston Peak, you now have a clear view of your destination - Flat Top Mountain. All you need to do from here, is follow the North ridge down, then back up, and catch the trail again over to the peak. The last 100 yards leading up to Flat Top Mountain. 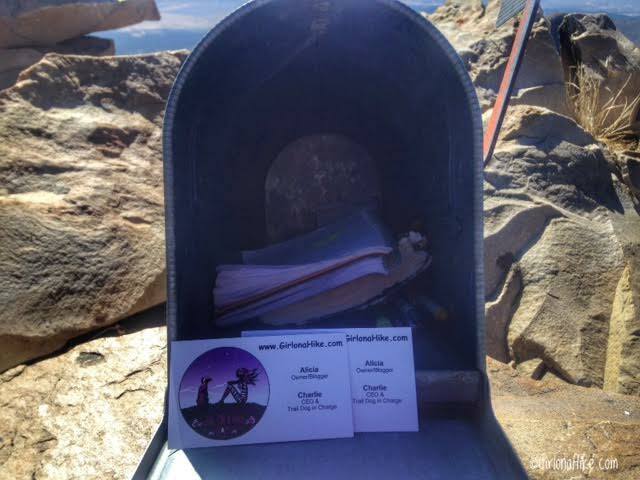 Flat Top Mountain is the first place I used my new, fancy cards. I came up with these to place in summit registers, as a way to let others know about my blog when they reach the peak, and hopefully will lead them to read about my adventures. 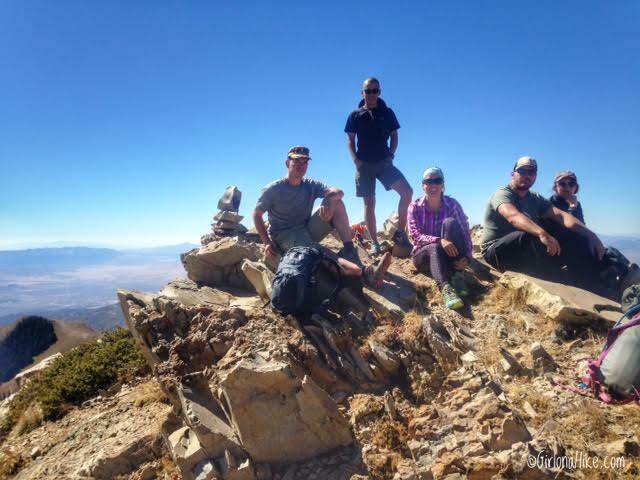 Group photo on the summit! 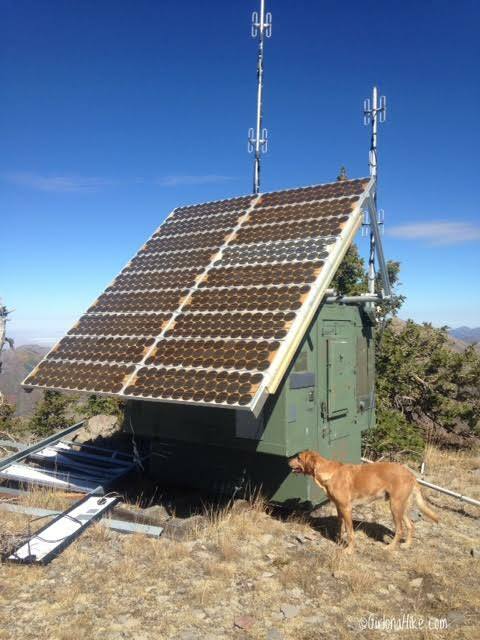 We hung out on the summit for about 1 hour, enjoying the views and soaking up the warm sun among the cool breeze. 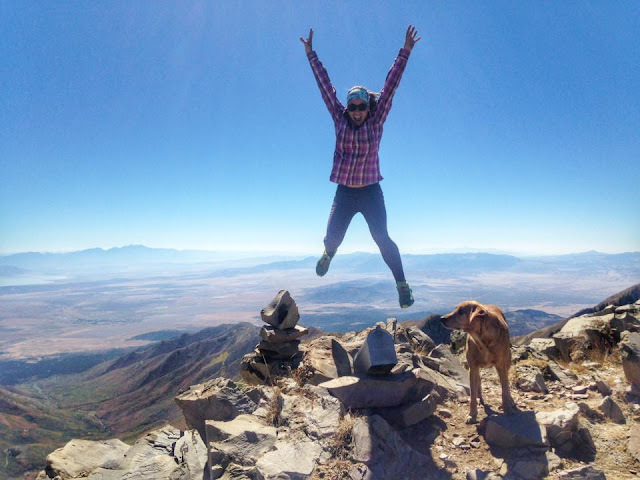 Summiting Flat Top Mountain was extra special for me - it was my last peak to complete all of Utah's Ultra Prominence Peaks! I was super excited that I was able to reach that goal, especially with Charlie by my side. Charlie has completed the 7 out of 8 Ultras with me (the only one missing for him is Kings Peak). 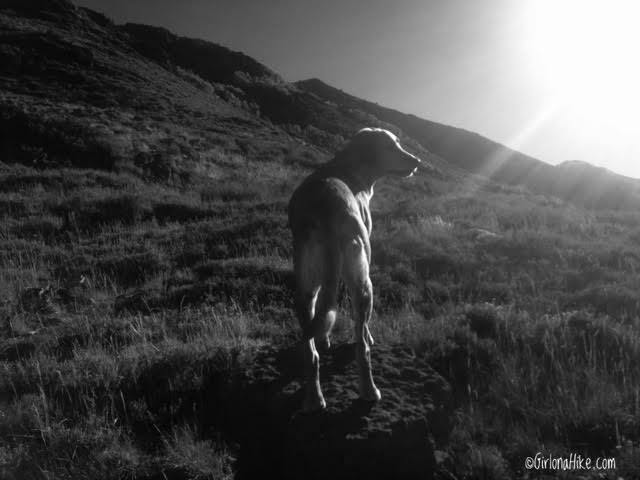 I'm so proud of him and glad we got to do all those peaks together. 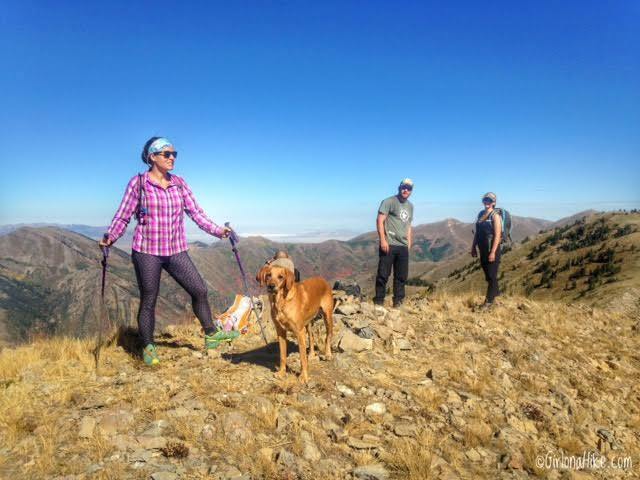 Read about all of Utah's 8 Ultra Peaks! 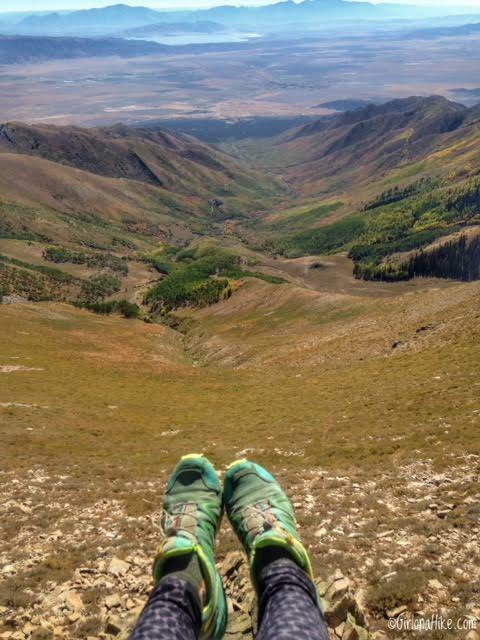 Sitting on the edge, looking down into the appropriately named, Meadow Canyon. In the far distance is Utah Lake and Mt. Nebo. Kicking back looking the other direction, towards Deseret Peak in the far distance. 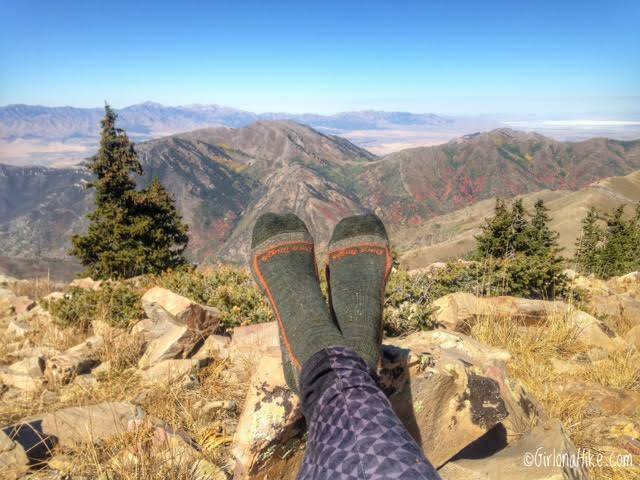 I love my Darn Tough socks! 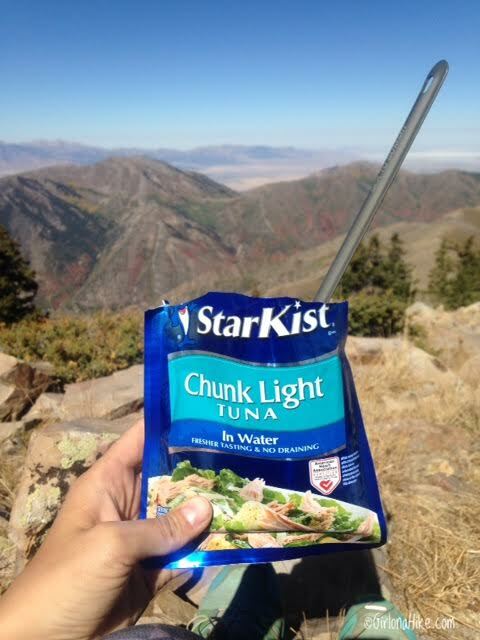 Summit Snack - tuna pouch with triscuits. I like using my backpacking spoon so I don't get my knuckles dirty from dipping my hand into the pouch. On Flat Top Mountain is this old communication structure, not in use now, complete with a door bell. 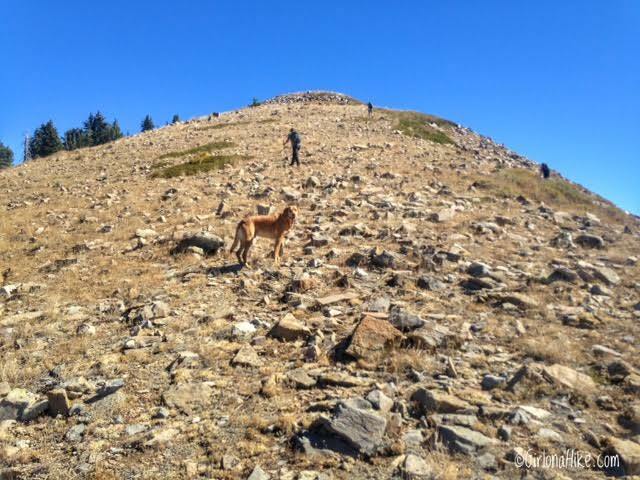 For the route down, we simply retraced our steps, minus summiting Lewiston Peak again. 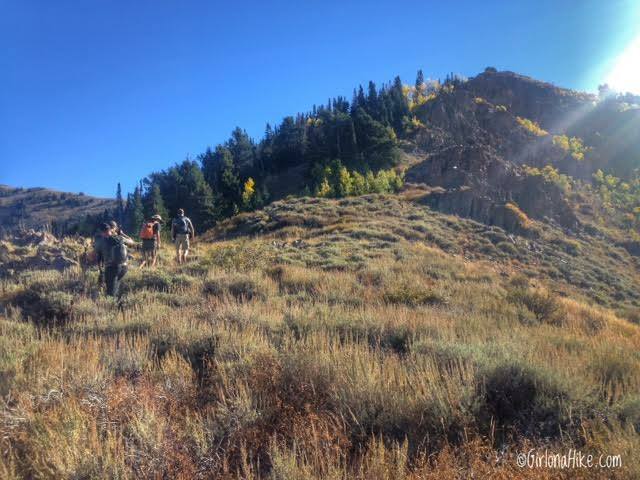 Instead, we skirted around and below the peak, and decided that instead of following the trail all the way, that we would follow the ridge down to the level part of the trail. It worked great and was much faster. It's up to you for how you want to get down, and whatever seems safest to you. Trail map for hiking to Lewiston Peak and Flat Top Mountain. 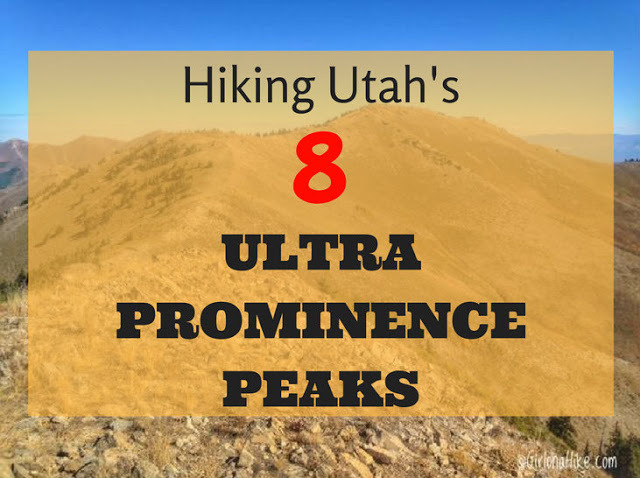 Check out my post on Utah's Ultra Prominence Peaks! Very helpful info! 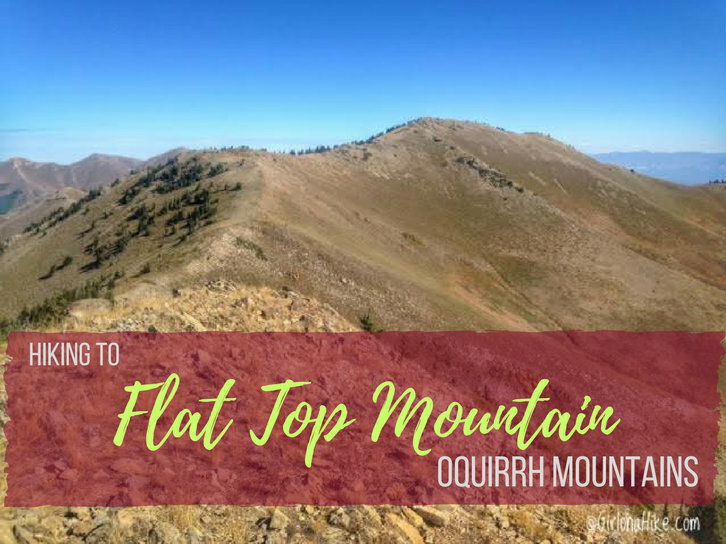 I hiked Flat Top today and did most of my planning with this post. Only 3 more Ultras to go!